Pick any spirit, and even a cursory search will reveal a long and fascinating narrative populated with the famous and the infamous. Case in point is the 300-year history of cognac: a legendary spirit sipped by kings and aristocrats, decimated by a parasite in the 19th century, favored by Asian VIPs, its praises extolled in hip hop culture. Thanks to the global cocktail renaissance, cognac is also being re-discovered as a key ingredient in classic recipes and modern interpretations alike. Angelenos interested in learning about cognac and its role in cocktail culture recently attended a Cognac Cocktail Class at The Varnish, presented by Liquor.com and hosted by Varnish co-owner Eric Alperin and GM Chris Bostick. 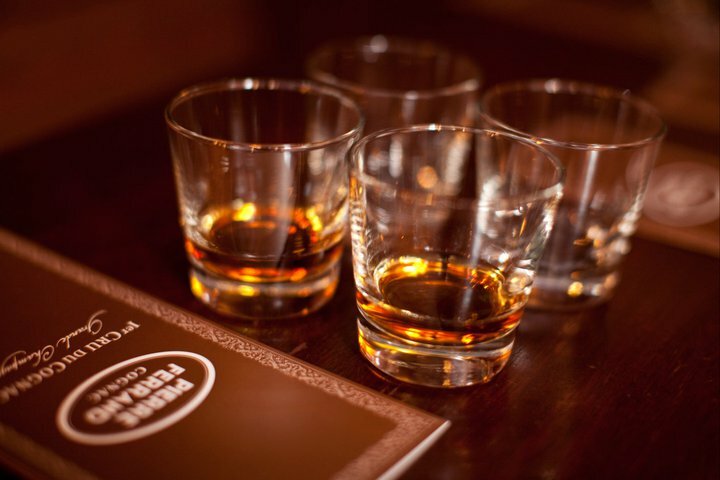 During the sold out two-hour session, attendees were educated about the luxury spirit, tasted expressions from the premium Pierre Ferrand line, and learned how to make four cognac cocktails. After we were seated, Liquor.com’s Chris Archibald welcomed us and did the introductions. Pierre Ferrand’s Jennifer Linsky then began the class with an introduction to cognac and an overview of the Pierre Ferrand production process before leading the cognac tasting. Cognac is a type of brandy, distilled from white wine produced in the delimited region surrounding the southwest French town from which it takes its name. The region is divided into six areas, or crus: Grande Champagne, Petite Champagne, Borderies, Fins Bois, Bon Bois and Bois Ordinaire. The wine to be distilled must be produced in the delimited region and made from at least 90 percent Ugni Blanc, Folle Blanche or Colombard grapes. 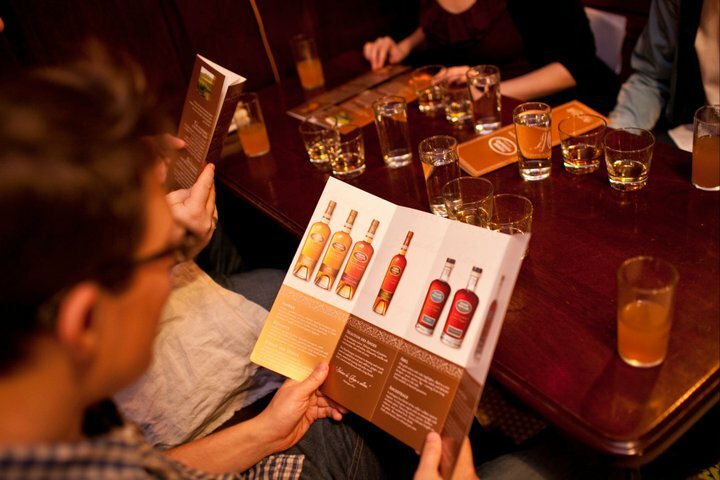 The wine must be distilled twice in copper pot stills. The resulting eau-de-vie (“water of life”) must be aged at least two years in French oak barrels. VS (Very Special) or ✯✯✯ (3 stars) – Cognacs whose youngest eau-de-vie is at least two years old. VSOP (Very Special Old Pale) – Cognacs whose youngest eau-de-vie is at least four years old. XO (Extra Old) – Cognacs whose youngest eau-de-vie is at least six years old. Cognac Master Blenders will generally use eaux-de-vie that are much older than the minimum requirement for their blends. The most prestigious designations may have aged for dozens of years before blending. Even if you’re not a connoisseur of cognac, you’re likely familiar with the Big Four cognac houses that dominate the global market: Courvoisier, Hennessy, Martell and Rémy Martin. While many of these cognacs blend Grande Champagne with lesser quality grapes, the Pierre Ferrand range is made exclusively from Grand Champagne grapes, which are often reserved for much more expensive releases. Pierre Ferrand cognac is twice-distilled in small copper pot stills from wine aged on its lees (aged unfiltered with dead/residual yeast and other particles) for added flavor and complexity. The eau-de-vie is then aged in French Limousin oak casks before blending. 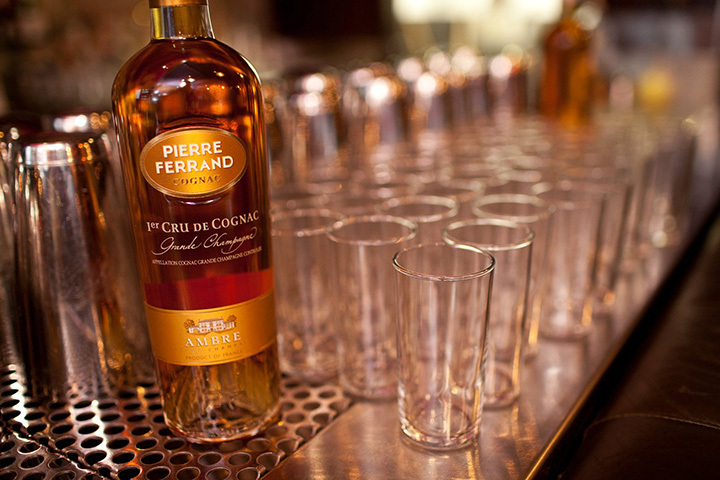 The tasting began with the Pierre Ferrand Ambre, at ten years old the youngest expression in the range. The Ambre has, appropriately enough, an amber-golden color. On the nose, a subtle vanilla leads to floral notes of roses and violets, as well as prunes and apricots, and finally baked apple and pear. The full-bodied palate is nuanced and complex, with pears and apples, as well as vanilla and cinnamon notes, and a hint of oak. The finish is warm and lingering. At a retail price of $45 (750ml), the Ambre is a superb entry-level cognac. Our second sample was the Pierre Ferrand Sélection des Anges, a 30 year old cognac named for the “angel’s share,” the portion of the cognac that evaporates through the barrel during the aging process. Linsky noted that the industry loses the equivalent of more than twenty million bottles of cognac every year due to evaporation. The effect of those decades of aging in the barrel can be appreciated in the cognac’s deep mahogany color. The initial nose of jasmine and honeysuckle develops into walnut, caramel and spices. The full-bodied, velvety palate is rich with vanilla and chocolate, with notes of saffron and ginger, as well as honey and oak. The warm finish is long and luxurious, a satiny aftertaste of spice, fruit and oak. Priced at $145 (750ml), the Sélection des Anges is an exceptional spirit. The angels taketh, but what they leave behind is, dare I say it, heavenly. Then it was on to the cocktails, beginning with the Vieux Carré. Named after the French Quarter in New Orleans, the Vieux Carré (“Old Square” in French) was invented in 1938 by Walter Bergeron, head bartender at the Hotel Monteleone. It’s always a pleasure to watch Alperin at work, even more so when he’s explaining each step: filling the empty glass with crushed ice to chill it before adding a bit of benedictine; using Japanese bitters bottles for portion control; starting with less expensive ingredients in the mixing glass in case of a spill. 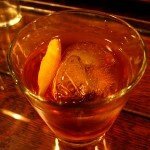 Note: Dolin rouge (sweet) vermouth was used for the Vieux Carrés served during the class. Rinse an Old Fashioned glass with the Benedictine. Add remaining ingredients and a large ice cube. Stir and finish with a lemon twist. 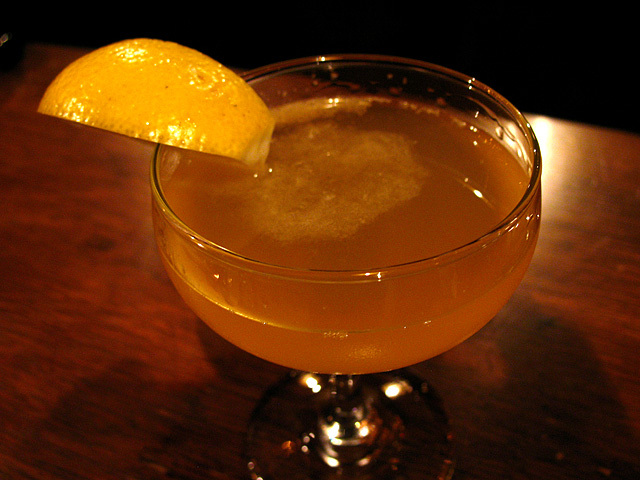 Imbibe magazine describes the Sidecar as “possibly the most alluring — and approachable — brandy-based cocktail of the last century.” Imbibe further notes that a low-quality brandy or orange liqueur “will doom this regal cocktail to mediocrity.” The familiar sugar rim, first mentioned years after the Sidecar’s invention, is omitted in this version. 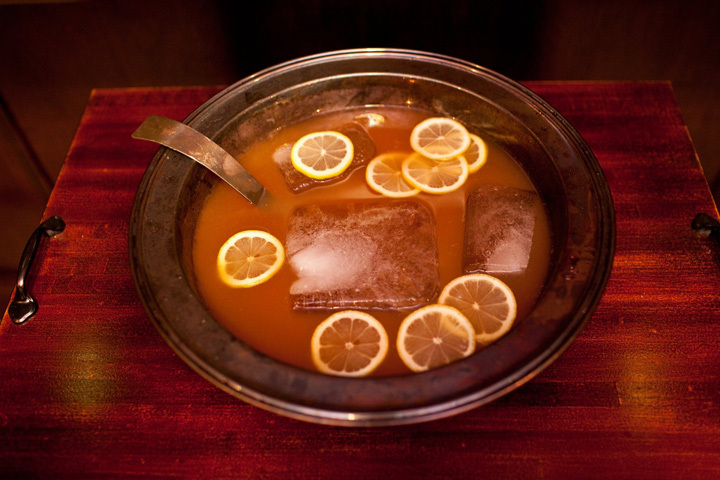 Strain into a chilled coupe and garnish with a lemon wedge. Although the layout of The Varnish isn’t exactly ideal for a class, attendees had remained attentive and craned their necks or stood up to get a better view of the demos. At this point the group was invited to gather around the bar and learn about our final cocktail of the afternoon, the Stinger. With everyone three drinks in and liberated from the confines of the booths, the “classroom” suddenly became a lively cocktail party. 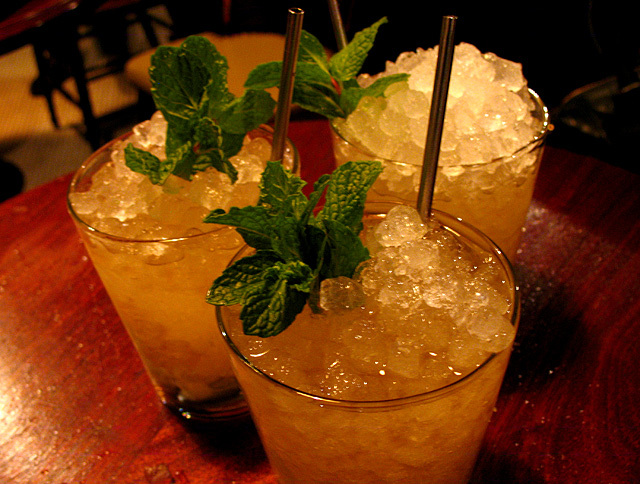 At one time a favorite tipple of the upper class, the Stinger is a Duo cocktail traditionally made with brandy and crème de menthe. In his entry for the Esquire Drinks Database, Wondrich writes: “Of all the indispensable cocktails, the Stinger’s origins are the most obscure…its conception is tied to no bartender, no grand hotel, no long-dead barfly.” Classic movie buffs may recognize the Stinger from movies such as The Apartment and Kiss Them for Me, while Mad Men fans watched Peggy Olson enjoying a Stinger in the Season Three episode Love Among the Ruins. 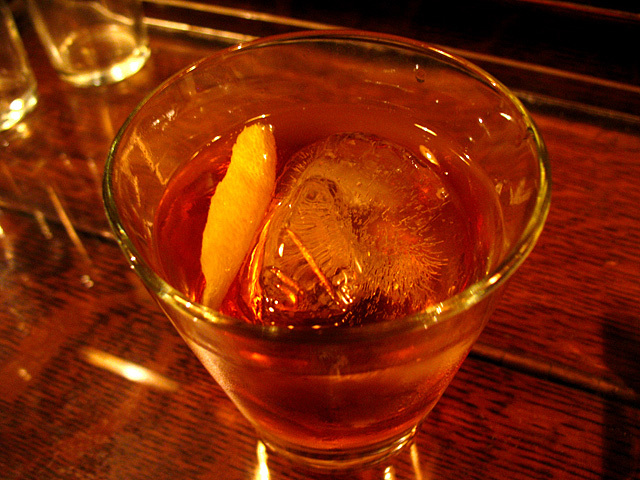 Toss and strain over crushed ice in a double Old Fashioned glass. The two hour session had gone by quickly, and as Alperin and Bostick answered questions and chatted with guests afterwards, it was apparent that the Cognac Cocktail Class was a success. Learning about one of the world’s great spirits, sampling two excellent expressions from an acclaimed cognac house, and sipping top notch cocktails at one of the country’s best craft cocktail bars; not a bad way to spend a Saturday afternoon.